Caption: Burrfish, Spiny Boxfish, Blowfish, Balloonfish, Globefish, Swelltoads, Hedgehog Fishes, Spiny Box Puffer, Spotted Spiny Puffer, Black-spotted Porcupinefish, Spotted Porcupinefish, Spotted Porcupine and Spot-Fin Porcupinefish. Found singly on coral and rocky reefs swimming high above the reef during the day. This one was under the steps of our bungalow. They feed nocturnally on hard shelled invertebrates. 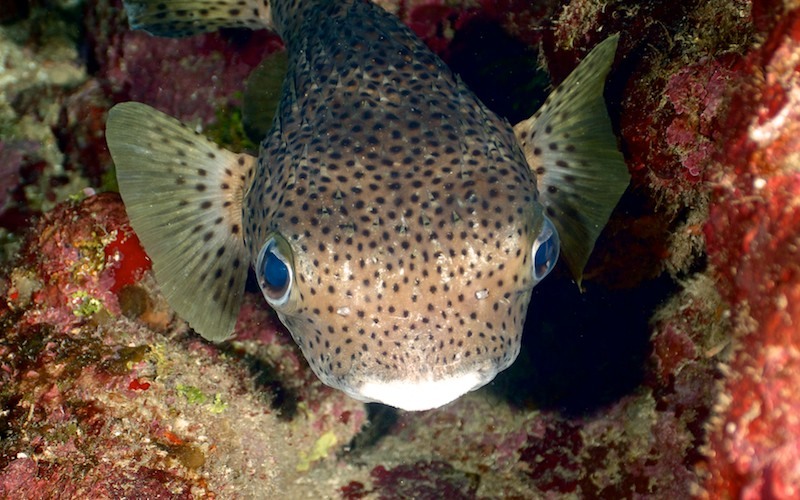 Length - 70cm Depth - 5-100m Circumtropical Porcupinefish spines lay flat, but when threatened they can inflate like a "football with spikes" so the spines are facing outwards to deter prey. The have a plated mouth structure for crushing shells or "fingers". Can give a nasty bite!